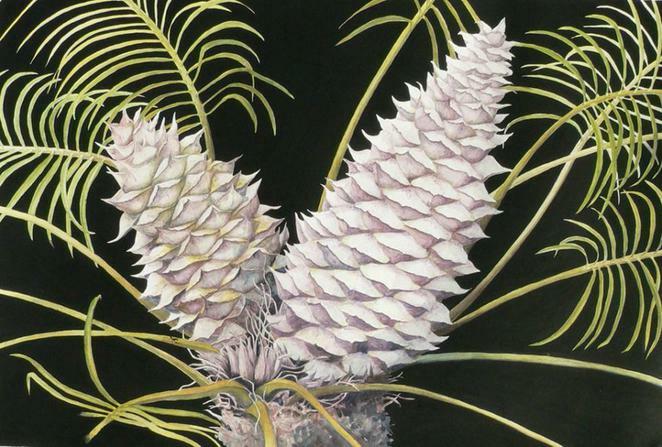 Lepidozamia peroffskyana, watercolour and acrylic on paper, by Margaret Hastie. Image courtesy BASQ. I arrive at my first beginner botanic drawing lesson with a fully-stocked pencil case and a vague hope that my amateur renderings won't have me laughed out of the classroom before morning tea time. It turns out that drawing a gum leaf is a lot harder than you'd think. I'm grateful I packed more than one eraser. But by the end of the three-hour Saturday morning lesson I've managed to produce a drawing of a curving leaf that, even if no great masterpiece, is at least satisfactory. 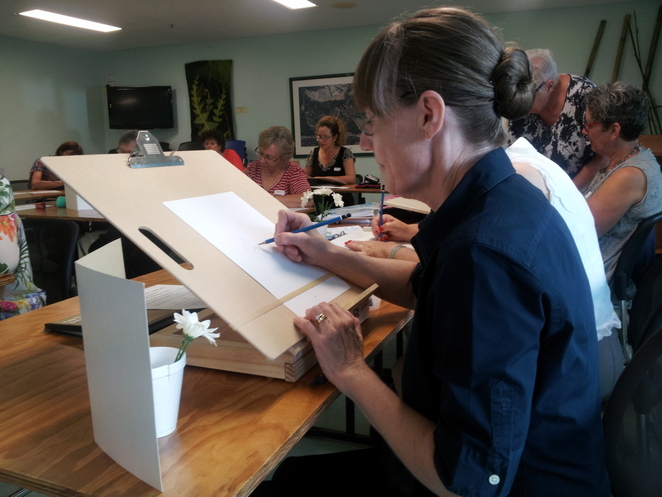 Running over four weeks, the Introduction to Drawing Part 1 – MH01 course offered by the Botanical Artists' Society of Queensland Inc (BASQ) is a popular entry point for people keen to try their hand at the genteel art of drawing plants. There are 18 eager students in both the morning and afternoon classes and many more on the waiting lists. There are a range of motivations for people to enrol. Among my classmates, there are people who are taking the course for pleasure or curiosity; others describe it as something they always wanted to do but previously couldn't find the time. Others are trained as horticulturalists, photographers, or scientists, and are seeking to incorporate botanic drawing as an adjunct to existing skills. Student Christine Challen in class. Author image. Despite the digital age, it's clear that this long-established art form is more popular than ever. From the illuminated manuscript of De Materia Medica through to works produced by illustrators aboard Captain Cook's 1770 voyage of exploration, botanical illustration has a long, proud and breathtakingly beautiful tradition. Hastie, an accomplished and award-winning artist, designed the current beginner courses in drawing and painting. She teaches them in the inspirational setting of the Brisbane Botanic Gardens Mt Coot-tha and encourages people to visit the adjoining library which carries a wide range of titles to build existing skills. Hastie says a large reason for the popularity of the courses is the simple fact that contemporary art colleges place limited emphasis on drawing skills. 'A lot of people simply don't get the opportunity to learn and practice the basics of drawing,' she says. The Botanical Artists' Society of Queensland is a voluntary, non-profit organisation formed to foster a greater knowledge, love and understanding of botanical art. The Society offers classes for those beginning or improving their art as well as opportunities for members to exhibit their work. When truly accomplished, students and members have the opportunity to show their work at the Society's annual Floressence exhibition. 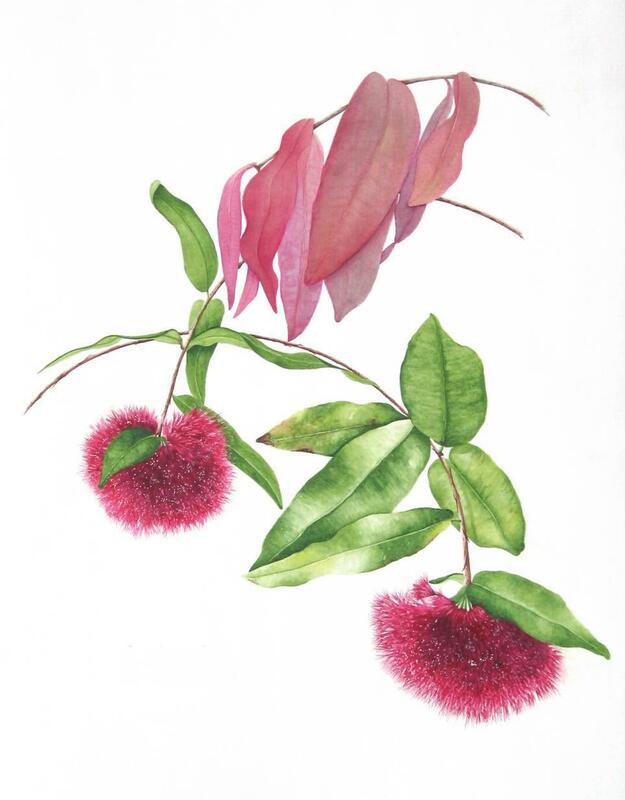 Syzygium wilsonii, watercolour, by Kristin Bain. Image courtesy BASQ.